Spring has officially arrived! 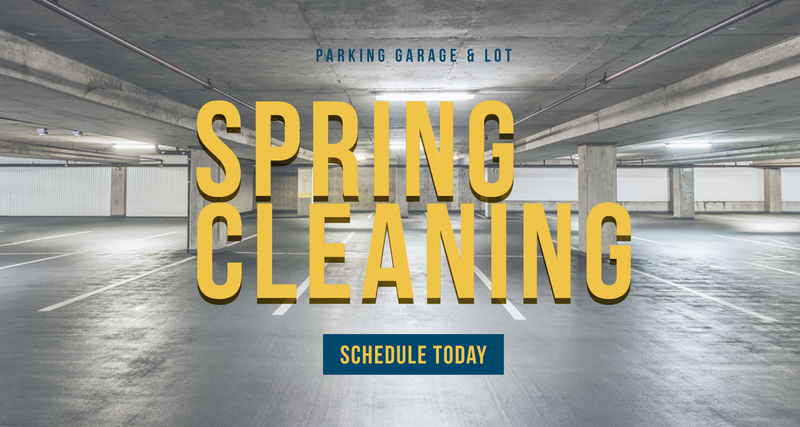 One of the first things we recommend you do is go outside and take a look at your parking structures and garages. Are they gray and dusty? Is there an unpleasant accumulation of sand and salt? Have the markings on the pavement faded? Has trash been blown into the corners? If so it’s time for spring cleaning. If the debris and chemicals and sand aren’t disposed of properly, you risk damaged concrete and clogged drains. Your concrete needs regular cleaning and preventative maintenance to prolong the life of the surface and save money on expensive repairs. But it especially needs a deep clean after one of our long midwestern winters. 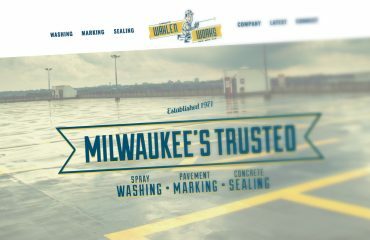 Located in the middle of the “Winter Facts” page on the Wisconsin DOT website is a list of some the materials they use to treat roads for snow and ice: calcium chloride, magnesium chloride, salt brine. Property owners should remove and dispose of pollutants properly for structural preservation. This maintenance also maintains an aesthetically pleasing appearance and prevents environmental damage. Engaging in prompt clean-up will also reduce the risk of injury to pedestrians who might slip on accumulated dry sand. 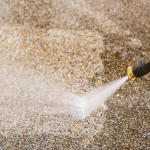 A thorough sweeping to remove trash, sand, salt, and any leftover leaves from last fall. 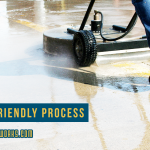 Pre-treating stains from oil spills, beverage spills, and other dirt deposits. 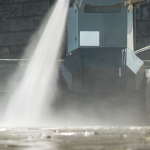 Professional power washing with a high pressure nozzle to deep clean the paved surface and lift out all of the dirt. 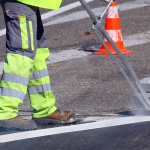 Re-marking of faded parking stall lines, pedestrian walkways, and directional arrows. 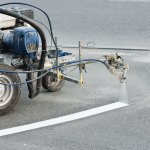 Concrete sealing to protect your surfaces from water, chemicals, and traffic wear-and-tear. Once each of the items above is checked off, it’s time to think about ongoing maintenance. Some facilities, such as hospitals, have a high volume of traffic and high turnover in the parking areas. Dirt and debris accumulate much faster than in a structure, such as an apartment, that doesn’t see as many vehicles entering and exiting. 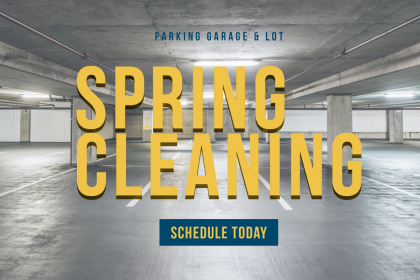 A high volume facility may require monthly sweeping while a low volume facility may only need two to three maintenance sweeps a year. Spring is a great time to consider a complete service package for your property. 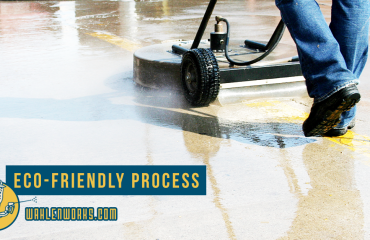 Service packages include sweeping, power washing, pavement striping, concrete sealing, and ongoing maintenance. This type of package offers the greatest value to the business owner. At Wahlen Works the cost is significantly less than if the services were purchased separately. We can create contracts for time periods between one to five years so that you can plan and budget accordingly. Longer term contracts lock in current pricing and save the headache of having to address the same issue year after year.